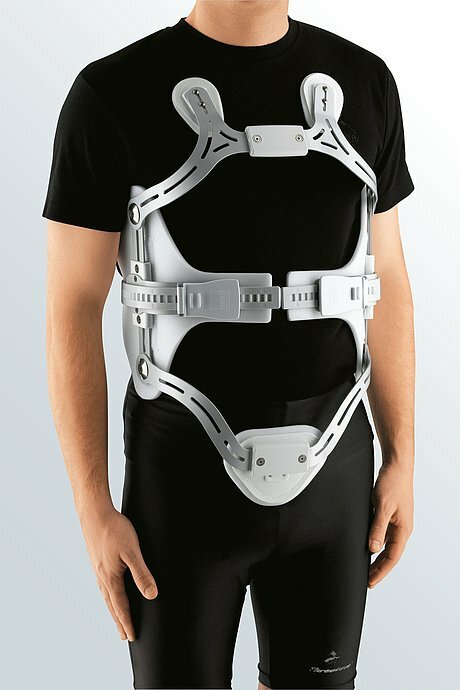 medi 4C is a hyperextension brace. The product is exclusively to be used for the orthotic fitting of the lumbar spine / thoracic spine and only on unbroken skin. First loosen the 4 allen screws on the chassis and adjust the orthosis to the width of the patient’s body. Please ensure that the orthosis lies flat against the body. Retighten the screws on the chassis. Loosen the two upper screws. Adjust the angle so that the two extension pads lie just below the cavicle. Tighten the two screws. Remove both side pads and loosen the screws on the lateral chasis. Adjust the orthosis to the length of the patient’s body. Important note: the chassis can be moved up or down on the connecting sites to match the level of the lesion. Take care not to bend the lateral frame sections for adjusting the length after removing from the chassis. If necessary, only the upper chest rod and pelvis clasp should be set. Do not use any sharp-edged tools. Sharply bent parts should be replaced rather then re-bent. Cut the padding to the required length and attach it with the Velcro strip. Tighten the chassis screws. After loosening the screws you can adjust the height of the extension pads and the lateral angle. Please ensure that the central chassis does not come into contact with the sternum. Loosen the two screws. Adjust the angle to position the symphysis pad to suit the body contours. Please ensure that the symphysis pad is not too low to allow the patient to sit upright. Now tighten both screws. Fold back the buckles of both closers. Push both ends of the straps into the clip openings from the back until they emerge from the front. Opening the clasp to 90 degrees and closing it draws the strap in and it can easily move into hyperextension. Caution: Do not close the belt by force! On reaching the desired final position, press both buckles closed. The strap can be shortened using scissors. In this case, please smoothen off the ends of the belt. Only one buckle needs to be folded back to remove the brace. Caution: Do not bend the buckle too far! The belt can now be simply pulled out. Adjust the belt length with the Velcro fastener and the guide loop so that the compression pad sits in the middle of the back. Please ensure that the grip fastener pulls in about 5 cm of the belt. Cut the side padding of the compression pad to fit. Please ensure that the padding of the compression pad and that of the side section do not overlap. Fold the buckle back and press it downwards. The closer is now fixed. Please ensure that the clip has been fully pushed down. You are recommended to check the function of the medi 4C and make any necessary adjustments on the day after fitting. 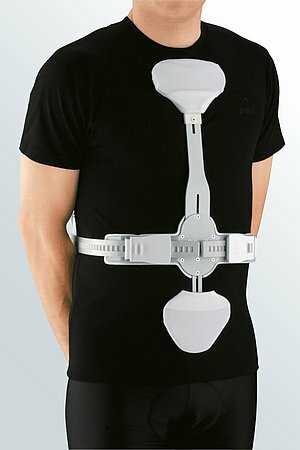 To make wearing more comfortable we recommend the patient wears a T-Shirt under the brace. Wipe the brace with a damp cloth. The back compression pad can be cleaned with a hand brush. 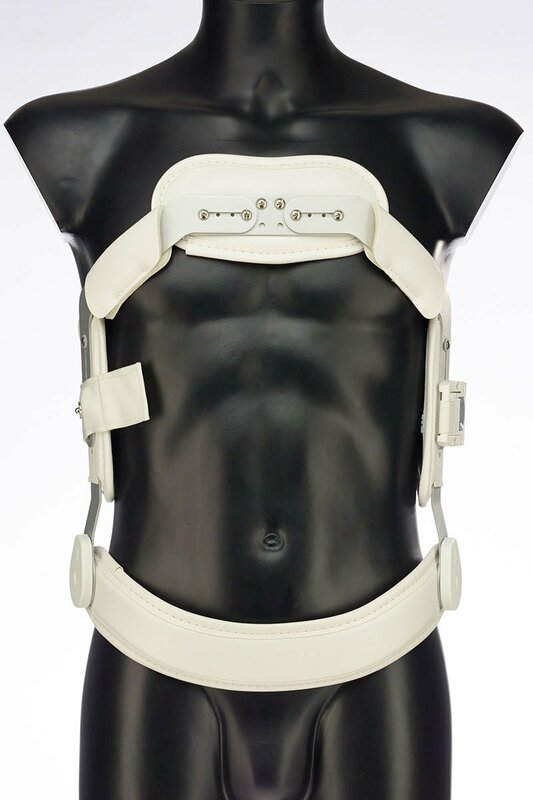 How to use our medi 4C 4-point hyperextension orthoses. Date of issue: until May 2017. How to use our medi 4C hyperextension braces. Date of issue: until March 2018. How to use our medi 4C hyperextension braces. Date of issue: until August 2018. How to use our medi 4C hyperextension braces. Date of issue: from August 2018.